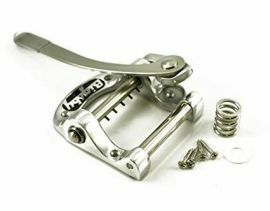 The original and genuine Bigsby vibrato unit. Originally manufactured in the mid 1940's and is still being made in the U.S.A. today. The B5 model is used for flat top solid body electric guitars such as the Gibson SG. It is often referred to as the "Horse Shoe" Bigsby. It comes complete with arm, 4 mounting screws to attach the unit to the front face of the guitar, and a spring to support the vibrato mechanism. It has a cast aluminum frame and nickel string anchor bar. Fitting instructions are included although we recommend a local guitar Luthier to fit it for you if you are unsure about carrying the work out yourself.